Patrick Gamble was nothing special until the day he got on a plane and hours later stepped off it, the only passenger left alive, a hero. Chase Williams has sworn to protect the people of the United States from the menace in their midst, but he is becoming the very thing he has promised to destroy. So far, the threat has been controlled by laws and violence and drugs. 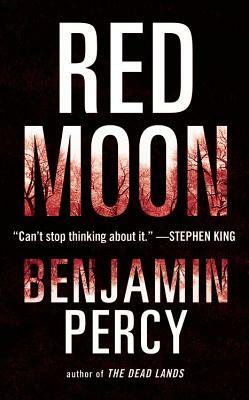 But the night of the red moon is coming, when an unrecognizable world will emerge...and the battle for humanity will begin. Benjamin Percy has won a Whiting Writers Award, a Plimpton Prize, two Pushcart Prizes, and a grant from the National Endowment for the Arts. He is the author of the novel The Wilding and two short story collections, Refresh, Refresh and The Language of Elk (available as an ebook from Grand Central Publishing). He lives in Minnesota with his family. For more information, you can visit www.BenjaminPercy.com. "Percy's latest novel is a smart, action-packed political thriller. . . . It's a high-wire literary act that the author pulls off with panache. "—Entertainment Weekly's "Must List"